This page is for the Japanese release of REFLEC BEAT for iOS, titled REFLEC BEAT plus. For the international version, please see REFLEC BEAT +. 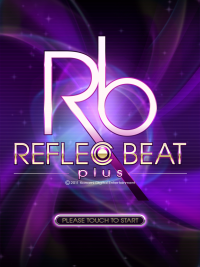 REFLEC BEAT plus is a mobile installment of the REFLEC BEAT series for the iPad (also on iPhone and iPod touch, updated to universal app on Aug 12, 2012). The game was announced during Tokyo Game Show 2011 and released on November 24th, 2011. Much like jubeat plus, it is available for free on the App Store, with 500-yen (US$3.99) song packs available through in-app purchase. Since REFLEC BEAT plus version 4.5.0, SPECIAL charts for certain songs can be purchased for 120 yen. Since REFLEC BEAT plus version 4.5.2, on iPad only, HIGH SPEED can be set between x1.0 to x2.0 in 0.1 increments, relative to the song's BPM. When HIGH SPEED is set to anything other than x1.0, two-player versus play (ふたりでプレー/DOUBLE) will be disabled. Depending on the HIGH SPEED value, the rival side's bar and 3TOP position would go upwards a bit or become completely invisible, like in the arcade series as of REFLEC BEAT VOLZZA 2. A variation on the Konami code Easter egg on the title screen can be used to enable Hinabita character backgrounds on the colette theme, as they appeared in the March 2017 Hinabita event. Swipe up twice, down twice, and then tap L-R-L-R-B-A using the letters in the REFLEC BEAT plus logo. PASTEL mode allows you to choose to play against Pastel-kun or Black Pastel-kun, instead of them appearing randomly. This mode isn't available on the REFLEC BEAT classic theme. GHOST mode allows you to play against a recorded play of your current best AR. Recorded plays are marked with an icon to the right of Best AR that lights up when GHOST mode is switched on. JUST REFLEC ∞ mode gives players on both sides an unlimited amount of JUST REFLECs to use. FULL COMBO mode puts both sides on autoplay with a 100% AR and the maximum of JUST REFLECs (which can be combined with JUST REFLEC ∞). Scores aren't saved for JUST REFLEC ∞ or FULL COMBO modes, but they can still be posted to Twitter with the mode labels added. All songs rated Level 11 or 12 were rated Level 10+ prior to November 29th, 2016. Due to a bug, ほおずき程度には赤い頭髪 is currently the only song with a 12 rating in game. Required GITADORA (Mobile), ポップンリズミン, REFLEC BEAT plus and jubeat plus installed on the same device from November 29th, 2013 to June 30th, 2016. Unlockable with 3000 Lime Points since February 20th, 2014 and 1500 Lime Points as of January 8, 2015. Required to purchase the three RUNRUN marathon PACKs from May 2nd, 2014 until June 30th, 2016. Required to purchase the 2 BEMANI スタジアム PACKs from August 1st, 2014 until June 30th, 2016. Free download using a serial code obtained at the JAEPO 2015 event on February 14th, 2015. Required to purchase the plazma, ELECTRONICS, BTR Variety, and both 新井大樹 PACKs from March 6th, 2015 to June 30th, 2016). Free download from April 14th, 2015 until June 30th, 2016. Available again since July 29th, 2016. Requires to purchase the 4 コナミ伝説 MUSIC PACKs since May 15th, 2015. Free download from November 24th, 2015 to January 15th, 2016. Free download since March 9th, 2016. Free download since April 28th, 2016. This page was last edited on 17 April 2019, at 19:07.